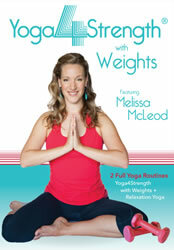 New Yoga4Strength ® With Weights DVD Featuring 2 Full Length Yoga Routines! Welcome to Relaxation Yoga! This is a cooling, calming 25 minute yoga practice that's appropriate for all levels. It is a gentle, full-body stretch that can be done on it's own or following your Yoga4Strength with Weights practice. This DVD is suitable for all levels, the relaxation and energizing practice are great for beginners and the Yoga4Strength routine is a little quicker paced and suitable for those with a little more fitness experience. Yoga4Strength was released in 2009. Click HERE for Melissa's bio. This is a gentle 20 minute relaxation routine focusing on seated and reclining postures. It is suitable for beginners and beyond. This is an energizing 25 minute yoga class focusing on standing postures and balances. It is suitable for beginners and beyond.